Like most of my 2016 reads, Alone Against the North was introduced to me by Janet Joy Wilson. Her "Earth Day Rocks!" edition of the #TMSBookClub briefly talks about climate change, the importance of bees and a quick tale about Canada's Indiana Jones. The last one really spoke to me. I picked up a copy and like many all of J.J.'s recommendations I did not want to to put it down. For three days, I took the non express trains to work so I could have a few more minutes to read about Adam's adventures. In the days of Google Earth and advanced satellite technology it's hard to believe that there are still parts of the world that have not been explored. In Alone Against the North, readers are immersed into Adam's adventures as he embarks on several thrilling journeys into an unknown part of Canada within the Hudson Bay Lowlands, located in Northern Ontario. Adam's journey was not an easy one. This was not one of those expeditions you see on TV. At the time, he did not have big name sponsors to fund an adventure of this magnitude. He travelled light carrying only the basic necessities to survive, similar to those of the explorers that came before him. In the pages that follow, you are absorbed into Adam's world as he goes through the Canadian wilderness. Just as you would expect there are stories of bears, goshawks and insects. His descriptions of blackflies had me swatting the air and shuddering at the thought of being swarmed by them. I tried to visualize the descriptions of the waterfalls and lagoons wishing that there were pictures included in the book. I followed along as Adam overcame his goal of reaching the Again River and all of dangers and triumphs that came along with it. I put down this book yearning to know more about the Again River and my country. 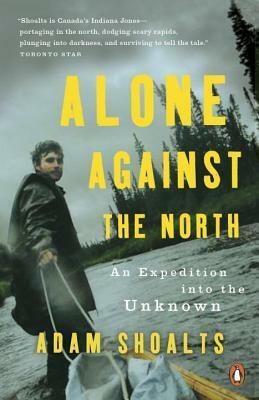 Alone Against the North is definitely a recommended read for anyone looking for an adventure. Adam's story is both educational and uplifting. His ability to overcome the physical and mental barriers during his expeditions will leave you inspired and empowered. There is no greater triumph than achieving a personal goal no matter how big or how small. Alone Against the North serves as a reminder that you can achieve anything if you believe in yourself. You can learn more about Adam Shoalts and his adventures from the video below or take trip to his website.